As we become more senior in terms of responsibility, our judgement and decision making becomes more critical. How aware are you of your bias? 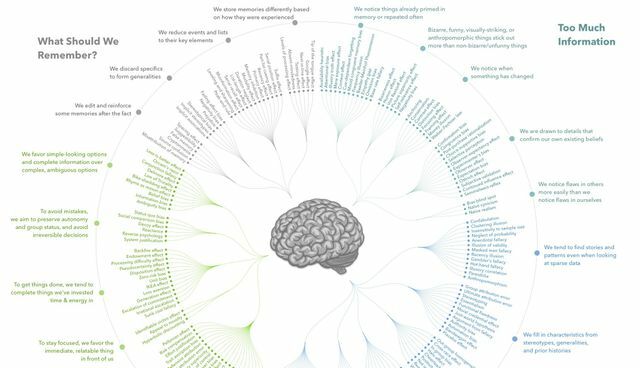 This is a great article and infographic to help you increase awareness of your likely bias, and help you to identify where you need to seek fact and data, rather than infer opinion and bias when making decisions. Humans tend to think in certain ways that can lead to systematic deviations from making rational judgments. Cognitive Bias Examples Here are four examples : Familiarity Bias: An investor puts her money in “what she knows”, rather than seeking the obvious benefits from portfolio diversification. Self-Attribution Bias: An entrepreneur overly attributes his company’s success to himself, rather than other factors (team, luck, industry trends). When things go bad, he blames these external factors for derailing his progress. Anchoring Bias: An employee in a salary negotiation is too dependent on the first number mentioned in the negotiations, rather than rationally examining a range of options. Survivorship Bias: Entrepreneurship looks easy, because there are so many successful entrepreneurs out there. However, this is a cognitive bias: the successful entrepreneurs are the ones still around, while the millions who failed did other things.